One of three new models introduced into the Papo dinosaurs range in 2014, is this super replica of the Early Jurassic carnivorous dinosaur known as Dilophosaurus and this is a review of this replica by Everything Dinosaur team members. This year marks the 60th anniversary of the naming of this meat-eating dinosaur. The first fossils ascribed to Dilophosaurus were found in the state of Arizona, in the USA, more specimens have been discovered in similar aged rocks but this time in China. This suggests that dinosaurs like Dilophosaurus were a very widespread and successful genus during a time when the number of different types of carnivorous dinosaur was rapidly increasing. Fossils found 60 years ago helped to describe Dilophosaurus. The model is posed with the three-fingered claws of the right hand resting on the ground. This helps balance this replica and permits the design team at Papo to keep the hind feet roughly in proportion to the rest of the animal’s body. Compared to later, larger Theropods, the arms of Dilophosaurus were relatively long. The hands and claws would have helped this dinosaur grasp and overcome struggling prey, as the jaws, although lined with sharply pointed teeth were actually quite weak. The most significant distinguishing feature of this dinosaur are the pair of thin, semi-circular crests that run the length of the top of the skull. The crests reflect the known fossil material very accurately, they even retain a small, backward pointing extension at the rear of the crest, the “Dilophosaurus notch” as it is often referred to as. The artists have painted the pair of crests a bright crimson colour. These crests, were probably used for display or for signalling. As far as we at Everything Dinosaur know, the crests have never been found attached to the skull. However, the standard restoration with a pair of parallel crests running along the snout seems the most convincing interpretation of the fossil material. The model measures 14cm in length, but as the tail is curled back over the body, the actual figure is nearer 18cm to 19cm in length. Based on the species from Arizona named Dilophosaurus wetherilli, we estimate that this model is in approximately 1:35 scale, although the maximum size of Dilophosaurus species remains unknown. Some individuals could have exceeded 6 and 1/2 metres in length. The replica is exceptionally well painted and seems to depict Dilophosaurus on the move. This model does have an articulated jaw, on some of the models the jaws are quite stiff but if the head is dipped in hot water for a few seconds then the jaw joint becomes more flexible and the beautiful detail inside the tooth lined jaws can be seen. Even the distinctive kink in the upper jaw can be clearly made out. The Papo Dilophosaurus dinosaur model has an articulated jaw. The light tan underside gives way to a darker greyish/brown top colouring with flashes of blue stripes along the back, the tail and down the hind legs. There is also a metallic orange stripe running from the back of the skull, down the long neck finishing at the hips. This is a very striking replica and an excellent addition to the Papo Dinosaurs model range. One of the nice things that we are seeing as Papo extends their model series, is that new models such as this Dilophosaurus work very well to scale when compared with existing Papo replicas. 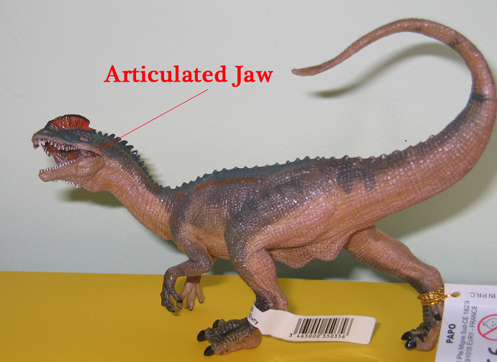 For example, the Dilophosaurus is in a comparable scale to the Late Jurassic Allosaurus model also made by Papo. The Papo Allosaurus and the Papo Dilophosaurus dinosaur models are roughly to the same scale. All in all this is an excellent Dilophosaurus dinosaur model and one that is a welcome addition to the Papo prehistoric animals model range.